The bread was updated with the Honey Oatmeal Bread Recipe. The bacon was updated with the grassfed, natural, uncured bacon that was marinated overnight. I used romain and spinach instead of ice burg lettuce. I couldn’t decide what to use instead of mayonaise so I created a garlic greek yogurt spread. And I threw in an avocado just for something a little more extravagant. DELISH. Everyone loves bacon..everyone, except..well..me. (I’m scared to even say that) It seems like people are OBSESSED with bacon. That’s fine with me, whatever floats your boat. Most of these people really don’t care about anything potentially harmful in this delicious slab of meat, I care! (but just a little bit, only because I don’t really eat bacon). All of this nitrate, nitrite talk seems pretty interesting, so it’s more of the science nerd in me than anything wanting to investigate further. I’m just putting this disclaimer out there, I don’t want to offend any bacon lovers out there. You can all keep eating your breakfast sandwiches, BLTs, and bacon wrapped in bacon for all I care. Sodium nitrite is an anti-oxidant used to cure meats like ham, bacon, and hot dogs. It gives cured meats their characteristic color and flavor. Nitrite prevents spoilage and stops the growth of botulism-causing bacteria. The jury is still out on this one. I did have a huge paragraph with all of these studies listing why nitrites are safe, carcinogens, and precursors to heart disease, but I don’t think there is a conclusive answer. Studies have shown that eating too much processed meat (nitrite-filled) is not beneficial to your health. We’ll just leave it at that. What about meats that are listed as nitrite-free? Let’s just say they aren’t actually nitrite-free. If the product contains plant ingredients such as natural flavorings or spices, celery juice, celery juice concentrate, or other vegetable powders, there is potential contribution of nitrate. When the nitrate from these natural sources is exposed to certain types of bacteria in the product, the plant nitrate is converted to nitrite. It is just a “natural” form of nitrite. 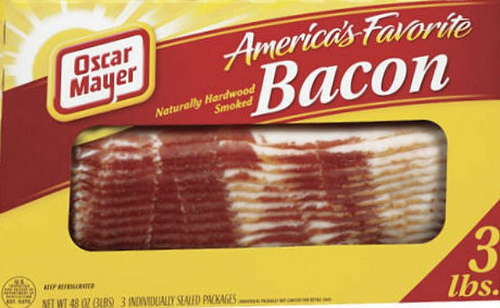 This isn’t really a healthier bacon. There isn’t any kind of bacon that is completely nitrite free (or healthy for that matter), that is what makes bacon bacon. Ingredient wise it’s not just the sodium nitrite, most of the bacon at the grocery store kinda skeeves me out anyway. Cured with Water, Salt, Sugar, Sodium Phosphate, Sodium Erythorbate, Sodium Nitrite, Flavoring and Paprika. Sugar, why? Flavoring..hmm, questionable. Also, most of the store bought, cured bacon has enormous amounts of sodium. Soo..where am I going with this? Well…I got my hands on some grassfed, organic, uncured bacon! Thanks to Sweet Grass Meats. And I had no idea what to do with it. 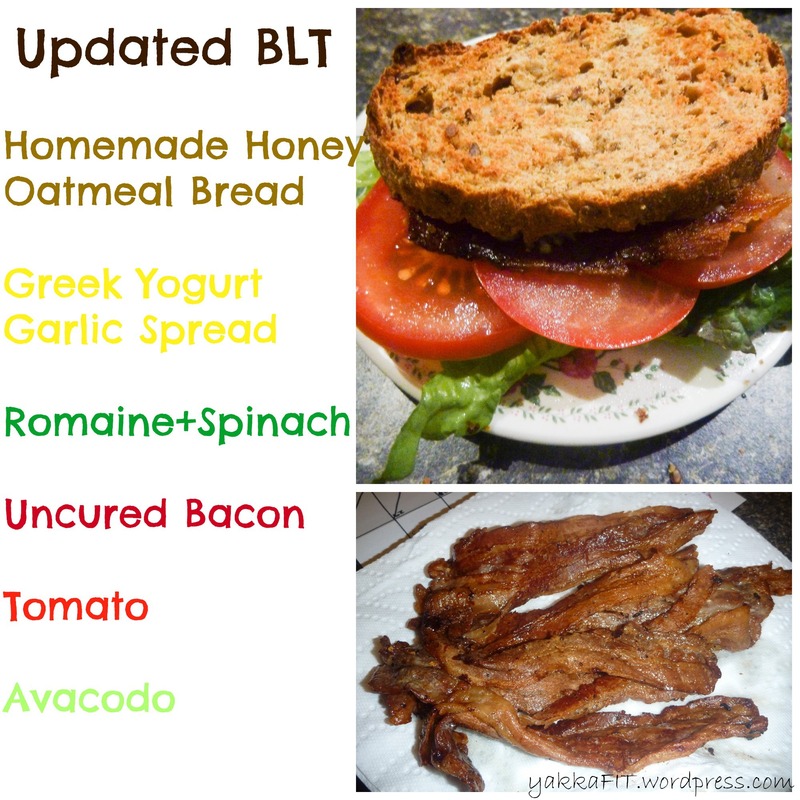 I couldn’t find a way to prepare unflavored, all natural bacon anywhere! (well..anywhere on the internet). So here is how my experiment went, in case you find yourself with some of this “healthier” bacon. I only say healthy because it came a happy pig that was roaming free in an open field, and it has no sodium, or questionable ingredients added. 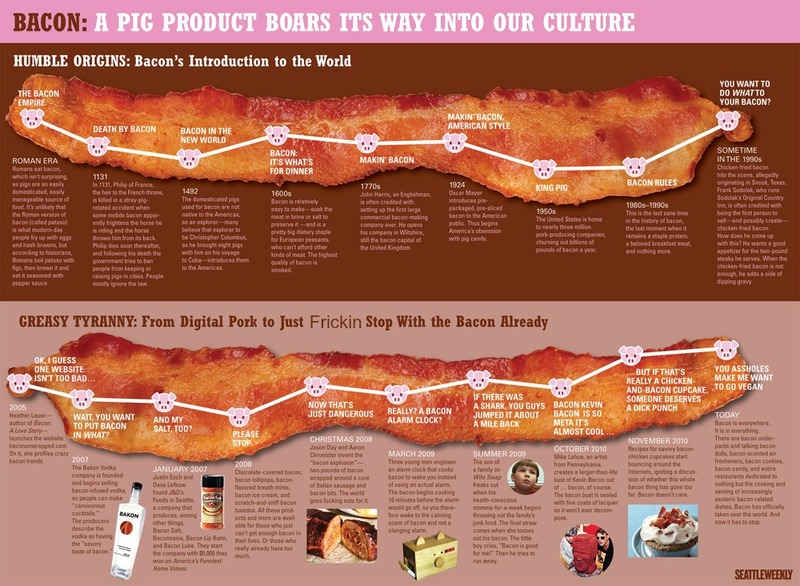 It does have nitrites, because again, that is what makes it bacon people! However if there is any form of healthy bacon, this is it. The man I bought it from told me to marinade it in apple cider vinegar, so I took his advice. 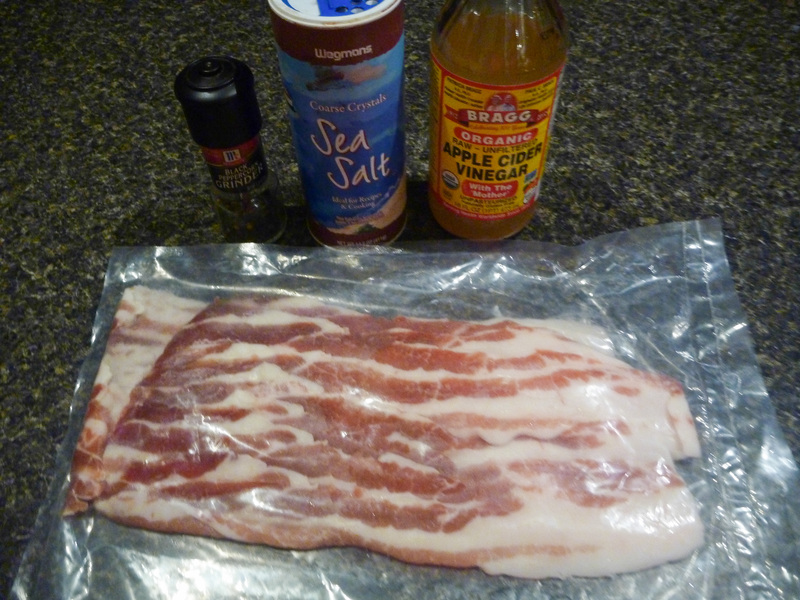 I rubbed the bacon with some sea salt, peppar, and garlic salt. (and by I, I mean my boyfriend, because touching raw meat gives me the willies). Then I dumped some apple cider vinegar in the bag, sealed it up, and left the bacon in the fridge overnight. Now to bake the bacon..hehee. I spread it all out in a single layer on a baking sheet and popped in a preheated oven at 375 degrees for about 20 minutes, depending on how crispy you like it. Halfway through I flipped each strip. I think cooking bacon on a cookie sheet is the easiest way to cook it. It doesn’t splatter all over the stove top, the bacon cooks evenly, and the grease can easily be saved for cooking later on. I thought this was delicious, I haven’t had bacon in a long long time, but my boyfriend agreed that it tasted even better than the store bought version. The whole house smelled like apple cider vinegar though, I’m not sure if that is a good or a bad thing, I didn’t really mind. Wait for tomorrows post to see what we did with this scrumptious bacon!